Image caption The EU's Brexit chief negotiator will be in Dublin on Monday ahead of a meeting of EU leaders later in the week. 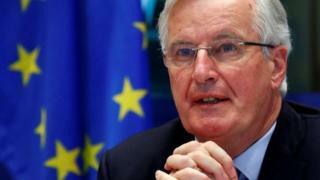 Chief EU Brexit negotiator Michel Barnier will visit Dublin on Monday for talks with Taoiseach (Irish Prime Minister) Leo Varadkar. The discussions come ahead of Wednesday's meeting of EU leaders. The Department of the Taoiseach confirmed the visit will go ahead "to take stock of developments in London" and plan for a possible no-deal Brexit. Mr Barnier will also meet Tánaiste (deputy prime minister) Simon Coveney and Finance Minister Paschal Donohoe. Cross-party talks between Labour and Tory politicians on Friday failed to reach a breakthrough. in the Brexit deadlock. Prime Minister Theresa May has written to European Council President Donald Tusk to request an extension to 30 June, which means the UK may now have to take part in European Parliament elections in May. Speaking on Friday, shadow Brexit secretary Sir Keir Starmer said the government was not "countenancing any change" saying talks had been "disappointing" and that "compromise requires change". Meanwhile, DUP leader Arlene Foster has reiterated her party's opposition to the Irish backstop, and said it was the issue Mrs May should use any additional time to deal with. "If she is looking for extra time now again, then she should use that extra time to do just that, to deal with that fundamental problem," said Mrs Foster. Image caption DUP leader Arlene Foster spoke of the current political "chaos"
She also said the DUP was prepared to take part in European Parliament elections. "Where we all want to be is in a position where the referendum is respected because, of course, the referendum is nearly now three years old," she said. "We're now talking about the bizarre situation of having European elections in a situation where, nearly three years ago, the nation said that they wanted to leave the European Union. "That's highly unsatisfactory, it's symptomatic of the chaos that is going on at the moment, but it also points to the intransigence of Brussels and the ineffectiveness of our own government in trying to get this matter dealt with." The Irish government's meeting with Michel Barnier will come days after talks between the taoiseach and German Chancellor Angela Merkel. Ms Merkel has said Germany would stand with Ireland "every step of the way" over Brexit on her first visit to the country in five years. She added: "Until the very last hour - I can say this from the German side - we will do everything in order to prevent a no-deal Brexit; Britain crashing out of the European Union. The taoiseach and Chancellor Merkel also held talks with people from Northern Ireland and the border area about the impact a no-deal Brexit could have on their livelihoods. Mr Varadkar said it was "important" to hear the voices of people who lived and worked along the Irish border. The EU has said 12 April is "the ultimate deadline" for approving the Withdrawal Agreement. It has been rejected by MPs three times, with DUP MPs voting against it - while independent unionist MP for North Down, Lady Hermon, voted in favour.